In the world of floor tile one of the latest entrants for new homes, remodeling and home improvement, is Limestone natural stone tile, as shown in Figure 1. Limestone is a beautiful stone, generally available in light browns, beiges and yellow shades. 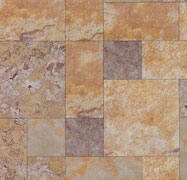 Limestone tile is usually provided with a matte finish, which makes it safer to walk on if there is any liquid spilled. Limestone tile is installed using the same methods as one would use for any other natural stone such as granite or marble and the joints in between tiles should be filled with a grout. To avoid the possibility of permanent staining the limestone tiles should be sealed with a high quality, penetrating, sealer. Limestone comes in a variety of square and rectangular sizes and is usually 3/16 to a 1/4 of an inch thick. Limestone is cut using a wet saw with a diamond impregnated blade. It cuts fast and has a relatively smooth cut line which can be easily filed to a very smooth finish. As with any natural stone, color matching can be a challenge and it is important that you purchase some extra tiles to ensure that the limestone tile was all cut from the same slab of material. The rule of thumb, if you are using a square grid pattern, is a minimum of 10% more than the calculated square footage of the area to be covered. If you are installing a diamond pattern the recommendation is 20% more than the calculated square footage of the area to be covered. With all the good points about the product, there of course, has to be a negative. Limestone should not be used in kitchens or bathrooms. In many areas, building codes, do not allow the use of limestone in restaurant kitchens. Limestone is a very porous stone that cannot be easily sealed hence, the pores within the stone become a haven for bacteria growth. Not what a home owner wants for his family, or guests in a kitchen or bathroom. For foyers, dining rooms and hallways limestone provides elegance and richness and blends in nicely with almost any choice of décor. Limestone tiles as with all natural materials will vary in shade and surface appearance. Polished - Only available with certain harder stones. Honed - The most common surface finish. Can vary between matte and a slight sheen. Brushed - A textured surface that varies with the hardness of the material and the degree of brushing. Water worn - A process that gently ages the stone giving a softer look with slightly contoured edges. Warning: Limestone is not recommended for use in kitchens, due to its porosity.